The Blackmagic Design Studio Camera 4K 2 is an updated compact and lightweight broadcast camera designed for live production. This is version 2, which removes the internal battery, making for a studio camera that is both lighter and simpler to ship to locations without running afoul of airline shipping restrictions. Constructed from a magnesium alloy body, the camera is light even for travel, yet durable enough for use in the field. It has a large 10" LCD screen with detachable sunshade and an active Micro Four Thirds lens mount for compatibility with a wide range of lenses. 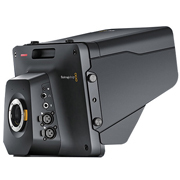 The camera also provides features you'd expect to find in larger studio cameras, such as tally indicators, talkback, XLR audio connections, 12G-SDI inputs/outputs, and even optical fiber via an optional module.